Linking related concerns that are often treated in disparate areas of international law and practice, this book reveals the interconnectedness in today’s world of drug trafficking and political violence. Suggesting a new approach to our political and moral values and the laws in which they are reflected, it offers a coherent legal definition of and reaction to terrorism based on a conceptual model derived from substantive criminal law, the law of war, and public international law. 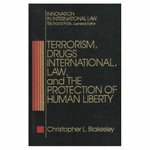 Blakesley, Christopher L., "Terrorism, Drugs, International Law and the Protection of Human Liberty" (1992). Books. 30.